Call us at 613-565-6194 or email us at ohevyisroel@gmail.com. We'll try to answer all your questions. 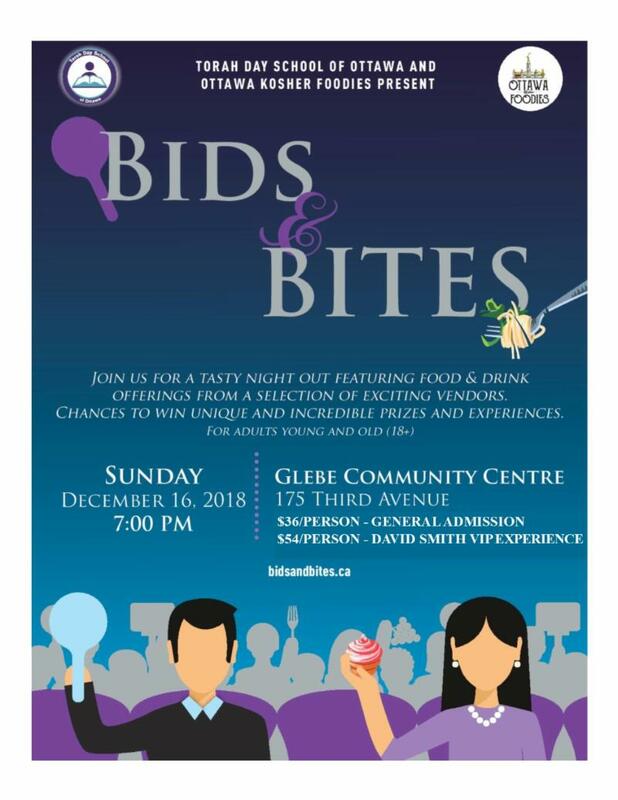 This tasty night out is five days away - this December 16, 2018 at the Glebe Community Centre. Get your tickets now! · Get your tickets now. The event website closes at 2pm this Friday. After Friday, tickets may be purchased at the door and during the event. · New food vendors - There are new local businesses that offer kosher products and you'll have a chance to meet them and try samples of their food at the event. · Experiences – Lots of great ways to make memories with a sleepover at the Museum of Nature, a media tour with Stuntman Stu, a VIP carriage ride and tour of the RCMP stables, a drive in a police cruiser to and from school, a beauty makeover, or a Q&A with a famous cookbook author. · David Smith VIP Experience - features the incomparable Creative Kosher Catering providing some of their signature dishes including prime rib, lamb chops, smoked meat and succulent sides, salads, desserts and more. Win! - Anyone who purchases a $54 VIP ticket for the David Smith VIP Experience will be entered into a draw and the winner will receive a $10,000 gift certificate from David and Creative Kosher Catering toward their next simcha or event. The event is hosted by Torah Day School of Ottawa and Ottawa Kosher Foodies and features three parts: a food expo, a VIP experience and many chances to win amazing prizes. The prize portion of the event is similar to our previous event, Chocolate Chances. We're excited to welcome Jakeman's Maple Products, King's Lock Craft Distillery, Olivia Chocolat, Rideau Bakery, Shillow Beer Co, Wizard Greens and others who will offer you delicious tastes of their products, some of which are brand new to the Ottawa kosher market. You can peruse the full list of over 50 fabulous prizes at bidsandbites.ca. Even if you can't attend the event, you can enter to win a prize. Tickets are $36/person for admission to the food expo and prize auction. To upgrade to the VIP experience, tickets are $54/person. Tickets can be purchased online at bidsandbites.ca or by calling 613 274-0110. Your support will directly help Jewish education in Ottawa. Help us make this event a success and help the students at TDSO.